This guy is part of a larger Tactical squad and my Client and I were discussing some options when it comes to tying him into the rest of the squad visually. Sure he has similar markings and such, but the portion we're most concerned about is his weapon. All of the guys in the squad with bolters are sporting the all red bolter case. We want to make sure the heavy bolter guy fits in with the rest of the squad and we're open to any suggestions you all might have when it comes to his weapon... or any other portion of him actually. Whatever it takes so that he fits in visually with the rest of the unit and still stands out enough to be recognized as the "heavy bolter guy." UPDATE: A huge thanks to everyone who commented. And a couple of you guys even added links that I've gone through and added below. At this point, we've gone with a limited red on the gun casing. Not completely red, but a good bit more than originally there. You guys were definitely right about having a bit more red on there. 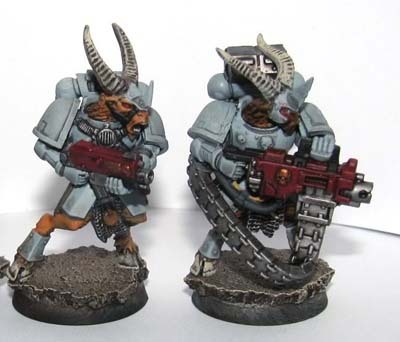 I think you could add a bit more red to the weapon the others seem to have about 50% red on the weapon frames, I would add a bit more to the heavy Bolter frame to make it match up. I actually think it looks fine as is - perhaps as John says a bit more red on the HB case, (perhaps just the top rail), but don't go overboard on it. I think the model looks very good and does tie in with the rest of the marines. 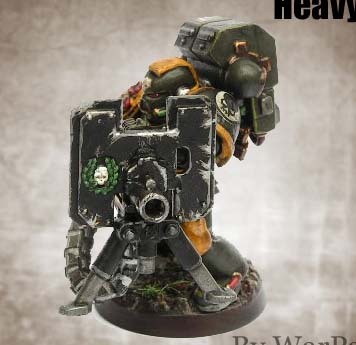 This model is carying a vanilla heavy bolter and i don't think you can do much more te it. However, I'm going to blatently self promote my own heavy bolter conversion here. I added a little something to my heavy bolter to make him look like he's carying a real HEAVY BOLTER!!. If you would convert him the way I did you could put the sqd markings and colors on the big armour plate. Just a thought, let me know what you think. I really like how it looks but I'd have to agree with John and Tom. There needs to be some more red on it. Maybe take it slightly reverse what it is on the rest of the squads. I'd have the bottom of the Bolter where the feed goes in shold be red as well as the handle on the top. You could also do the site itself but that might take it too far. With the size of the gun adding that little red will feel more of the same squad as the rest of the troops. 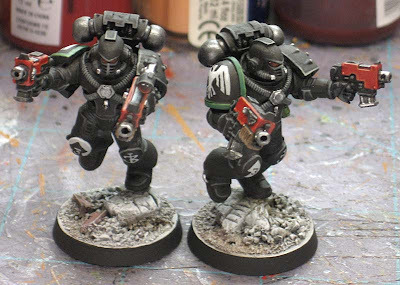 I thing a bit more red will not hurt the figure, in fact it may draw the eye to him so he stands out as "heavy Bolter guy"
All in though the commission is looking spot on, the black is just SOOO nice. 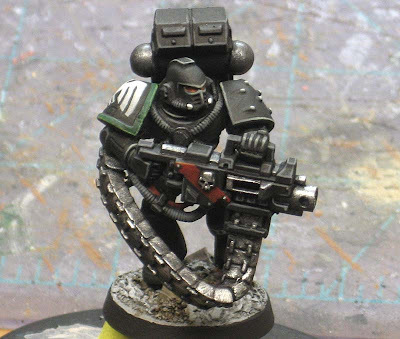 I cant remember what the back of the heavy bolter back pack looks like, but what about adding a spot color of red to the backpack as well. This would be something else to draw the eye to the model without him having a great big red gun. I say paint the heavy bolter casing red. 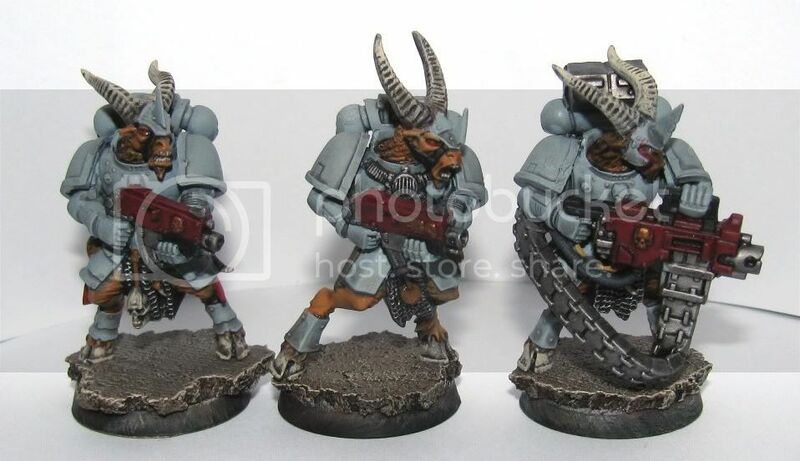 I hate to hijack, but here's a link to some guys I did with red bolters/heavy bolter. My suggestion is paint that side plate all red, and give it a black stripe instead of red. As others have said, more red on the casing would tie the squad together better. The red stripe is nice, but it's just not enough. I would bring the red across the casing past the ejection port and fill in the "U" shaped piece at the front. And also fill in the corner of the casing to the left of the stripe. 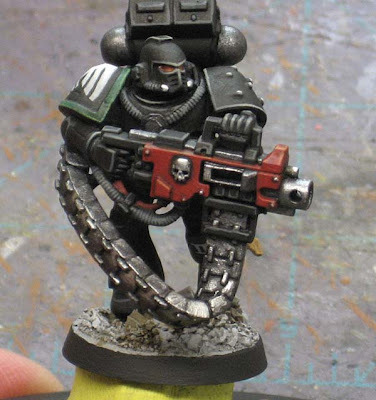 That´s exactly what I did with my raven guard when i realized that for a sneaky chapter is better to have black armour as well as black guns too. If you want to keep with the red weapons thing I would suggest you to make another pair of red thinner strips to make the weapon more red without being completely red-cased. Or you can do what someone suggested above, paint it red with a black strip. Thank you to everyone for the suggestions. There are some good ones here that had not thought of yet. I am noticing some GW paint in the background...can that really be true? Adding a red stripe or two more is a good idea, i think. SC Mike: Those are NOT my paints, they belong to a "friend" who left them at my house. If you're looking to add more color, I've had good luck picking out the links on the H. Bolter ammo feeder/belt thingy with a different metallic. a 2:1 mixture of gold to red makes a lovely copper that would make him pop nicely and takes washes very well. I would say to paint some red on backpack, as Danny said. That would, I think, make him stand out more and be connected with rest of the squad. Do the left hand-hold on the weapon up in the same red and that will tie it in nicely. I think he needs a little bit more red. But, who's to say it needs to be on the weapon. He is "the heavy weapons guy" so instead of thinking "how to make his weapon stand out" think along the lines of "How can I make HIM stand out". Red stripe across one of his eye lenses. Red details on his ammo pack. Something to make him pop out of the crowd. Again,these are just examples, and in the end you got to find what works for you. Maybe consider using heavy stubbers for heavy bolters instead. They are lighter weight and smaller, so can be better handled by these fast moving stealthy tactical squads. Thanks for all the help guys, I do appreciate it. I've gone back, made some changes and sent pics off to my Client. We'll see what he thinks and I'll post the final results. I like the new bolter better. My only complaint is the bases. I think they need static grass or some more color to break them up a bit.